Nowadays almost everyone has a WordPress powered website, but not everyone has a professional build blog. To build a professional blog you have to concentrate on few aspects. It’s feature can be extended with multiple widgets that it supports. There are hundreds of thousands of them in WordPress plugins area. There are many widgets that can fulfill your specific needs. Here is a list of top 10 must have free WordPress dynamic sidebar widgets. You should choose the ones you think that fits your needs and try to avoid the situation described bellow. If you enjoyed the following article we humbly ask you to help us spread the word by sharing this article with your peers! Following are some more related articles that you may like to browse through: Premium WordPress Themes for Architecture Firms, Cool Free Marketing WordPress Themes, Responsive Gallery WordPress Widgets and Free MP3 Plugins for WordPress. A WordPress Plugin to create a custom widget areas or sidebar easily. It allows user to create multiple widget areas from admin panel and allows to use it anywhere like in theme sidebar or in any page/post content. 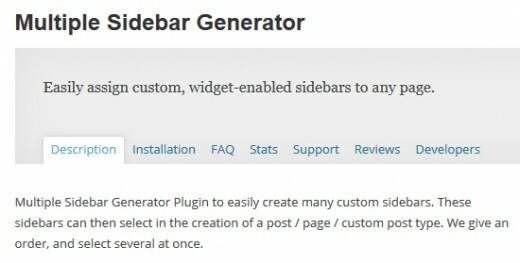 Multiple Sidebar Generator Plugin to easily create many custom sidebars. These sidebars can then select in the creation of a post / page / custom post type. If you want to assign custom sidebars to archive pages or replace multiple sidebars per page, this plugin likely won’t be the best solution. However it’s flexible enough to handle a wide range of page-based use cases. With Pojo Sidebars you can create as many sidebars you need for any page you want. Especially for themes based on Pojo Framework. You can easily separate your site into sections, as well as set a specific sidebar for every single page or custom post type. You can replace any sidebar with a different one by embedding it in the Text Editor with a unique shortcode. A simple and easy way to replace any sidebar or widget area in any WordPress theme without coding. This plugin integrates with the WordPress Customizer so you can preview your custom widget areas on your site in realtime. It’s compatible with any theme and you can even replace more than one widget area on the same page! It allows you to manage your custom sidebar replacements in the WordPress Admin area. IntelliWidget is a versatile WordPress plugin that does the work of multiple plugins by allowing you to create custom “Profiles” for any page or post that can be used where the default widget would normally appear. Each profile can have its own set of rules to display content any way you wish. Use the Shortcode option to put the power of IntelliWidget into any post on your site. This is a simple WordPress plugin which allows a site administrator to limit the number of widgets in a sidebar. You simply go the the settings -> limit widgets page and customize the maximum number of widgets used for each menu. A nice visual effect will appear in the sidebar in the WordPress admin and the client will be unable to drop new widgets into the sidebar once the cap has been reached. Designed for simplicity and flexibility, Simple Page Sidebars gives WordPress users, designers, and developers the ability to assign custom sidebars to individual pages–without making any template changes. Existing sidebars can also be assigned in quick edit and bulk edit modes, helping save you time. In contrast to some of the more complicated plugins available, Simple Page Sidebars aims for basic, core-like functionality and integration that’s easy to use without polluting your admin panel. You can manage any number of sidebars/widget areas with this awesome plugin. You can feel your WordPress site more dynamic. With this plugin you can also fetch your Sidebar/Widget area any where you want like in any posts or pages with shortcode. Right after you add the sidebar from its setting page, you can see the shortcode. Go to widget page and drag and drop any widget you want place in newly created sidebar/widget area. You can certainly create multiple headers by creating different files for it in WordPress. Nevertheless, the process is a bit lengthy when you have lots of pages with different header or footer or sidebar. Overcoming the entire process, our HFS controller sets you free from all these hassles. You just need to install this plugin and it will appear right there on the editing page/post.